I love cream blush. I need it most of all in the Summer but in the Winter I have dry cheeks so it works for me then as well. I find that blush can disappear on me during the day so a nice creamy blush not only helps me look a little more alive but it also helps me look less like the walking dead come 1pm. Have you ever looked in the mirror and thought who is that girl? The one with the monotone face and shiny nose? Ummm yeah. I know her and I am her if my blush isn’t on point any given day. 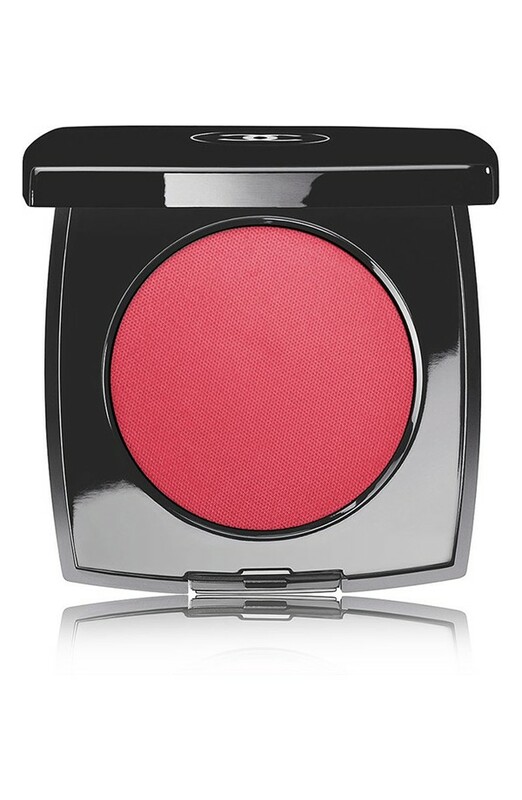 Que the Chanel solution it’s Chamade blush. 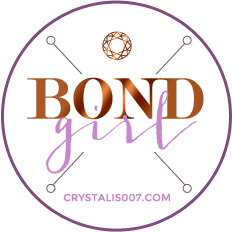 She’s bright and she’s beautiful and her deep pigmentation will break your freaking heart! This is my second Chanel cream blush. I love the first one I picked up Fantastic it’s more on the plummy side. I These blushes stay put on the skin and blend in easily with a brush or fingers. I usually use two fingers to tap them into my cheeks and blend. You need very little product since the pigmentation is so good. This is a purchase that will last a long time for most folks. The price tag is steep so I get colors I know I’ll be in love with for years. I like colors that make it look like you are “lit” from within. This is one of those! 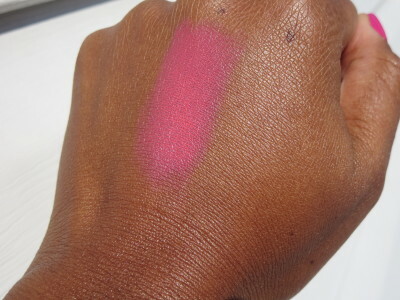 Here are some quick hand swatches so you can see the pigmentation-it’s off the chain! Ok here comes a quick cheek swatch. Now I’m wearing a little of my favorite Iman BB Creme-Earth Medium but look at the color on my cheeks! I went a little heavy with Chamade. 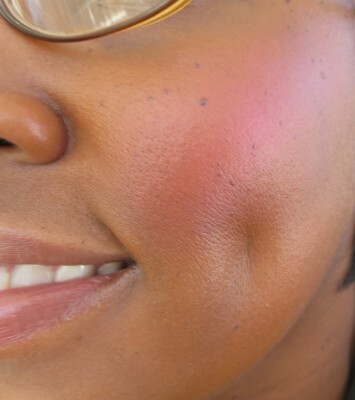 The nice thing is that you can tone it down with your favorite pressed powder but these cheeks are poppin! Ahhh the older I get the bigger my dimple gets! But see the color? It’s a pretty flush of color on the cheeks! That’s the end of my story. Nuff said….I love Chamade! I have yet to try Chanel’s creme blushes. I usually love that formula but I picked up Dior’s creme blush from last summer I believe, and it was very drying. I had picked up two and had to return both of them. And the sad part is, I had only opened them a handful of times, making sure to tightly cap it. Still dried out on me. But Chanel has so many pretty creme shades, and I haven’t heard anything bad about them yet so maybe I’ll get around to trying one! I haven’t had any problems with the first one I picked up and they seem so creamy. The Dior ones I’ve heard from friends aren’t working out which is such a shame! Do these blushes have a scent? I am always on the lookout for pigmented cream blushes. Like you my cheeks eat blush especially in the summer. No I don’t smell any scent with these! I like this one too! How do you find such great shades? I’m going to have to pick this one or the Emotion powder blush which would you pick? Ooooohhhhhh girl you are killin me!!! Between your YT channel and me stumbling into your vlog channel ( which I subscribed stat!!) and reading your thoughts and opinion with all these gorge necessities…. I have yet to try this blush!!! Looks awesome on your cheeks!! Want to know have you tried the blush / Stain by IT cosmetics?? .. Saw it on qvc but I wasn’t sure if I should get it.. What are your thoughts on this.. Thanks! Yes I tried the powder blush stain. They came out with a set of three for the holidays in 2012 and I really liked it. It had Sweet Cheeks, Rose Glow, and Love Story in it. I reviewed the Vitality blushes on here they are nice also!